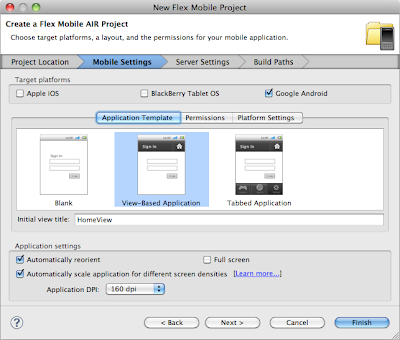 This blog post will discuss making a simple mobile application using Flash Builder 4.5. I will be targeting the Acer Iconia A500 Tablet because it is currently the only mobile device that I have access to, but it should be relevant to other mobile devices too. 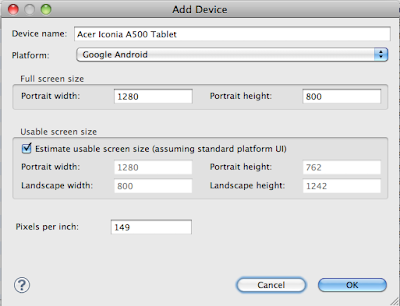 The Acer Iconia A500 Tablet runs on Google Android 3.0 (Honeycomb). For a full review of the tablet, read this article. It sells for around $450 for the 32GB version. Check the USB Debugging option. This allows Flash Builder to debug applications straight on to the tablet through USB. Next, connect the tablet to your computer using the USB cable provided. 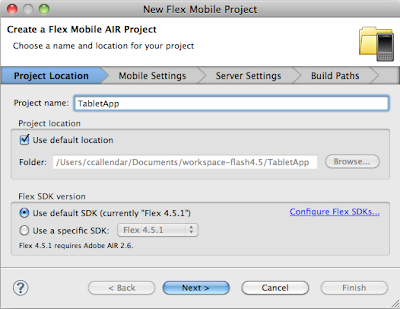 Inside Flash Builder, create a new Flex Mobile Project. Give it a name like TabletApp. Click Next. Select the desired target platform(s). For the Acer Iconia and other Andoid tablets, check the Google Android checkbox. You can choose the mobile app template to use here as well. Important: your mobile application might need to have access to the internet, the file system, the gps, etc. Under the Permissions tab, choose the Google Android platform, and check any of the permissions that your application needs. 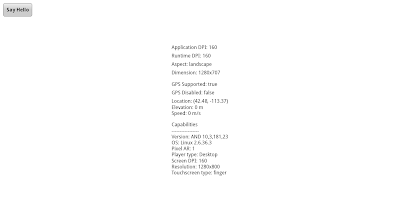 For my sample application I chose the INTERNET, WRITE_EXTERNAL_STORAGE, and ACCESS_FINE_LOCATION (GPS) permissions. Click next. 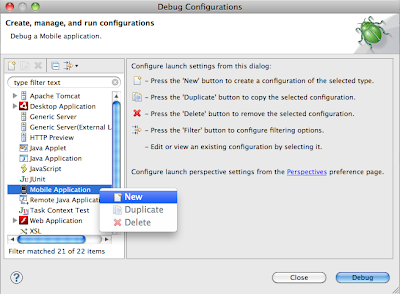 Set up the build path if necessary, or leave it to the default values. 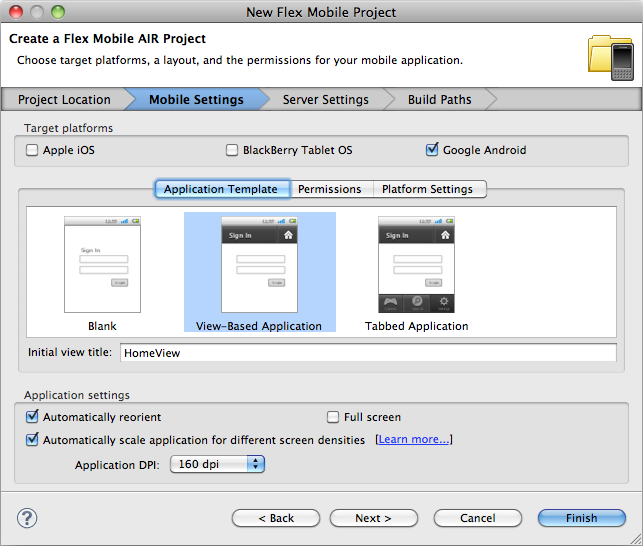 Once the project is created, Flash Builder will open the two main files - TabletApp.mxml (the main application file), and TabletAppHomeView.mxml (the default home view component). Add in some components to the home view like a button or a label. Now, to test our your application on the Acer Iconia Tablet, make sure it is connected by USB, and that you followed the step above on the tablet to enable USB debugging. 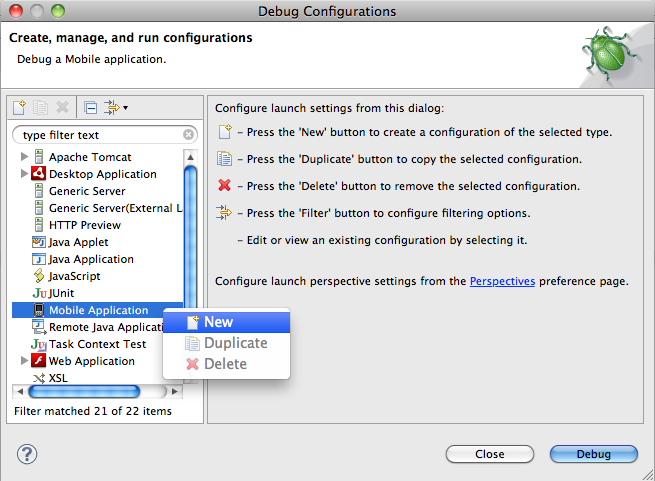 Under the Run menu, choose Debug Configurations.... Add a new Mobile Application launch configuration. 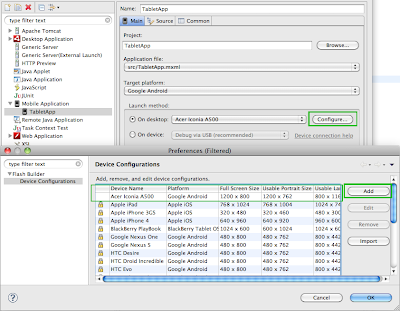 Choose your project and application, and the target platform (Google Android in this case). 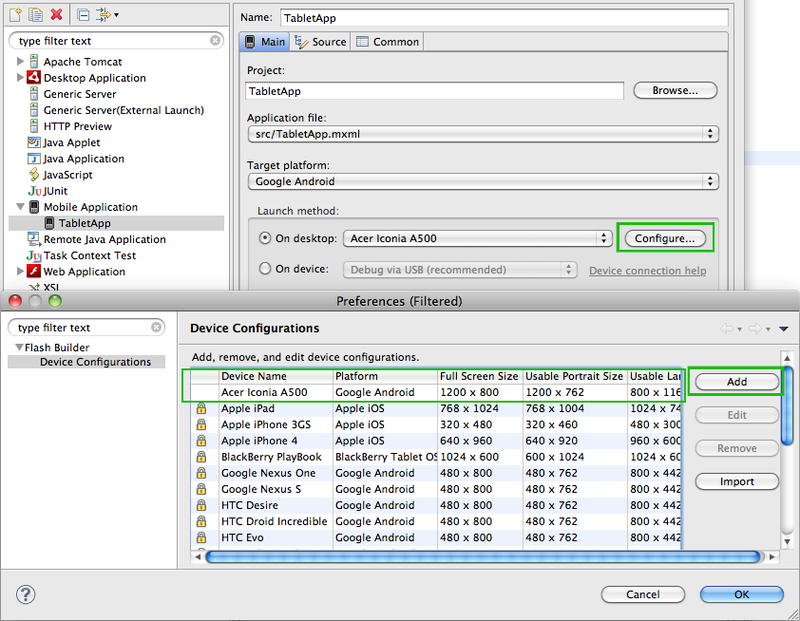 Under where it says "Launch method", choose the On device radio button. If you have trouble connecting, then read the Device connection help page. If all works as planned, you should see on the tablet the simple application that you created. 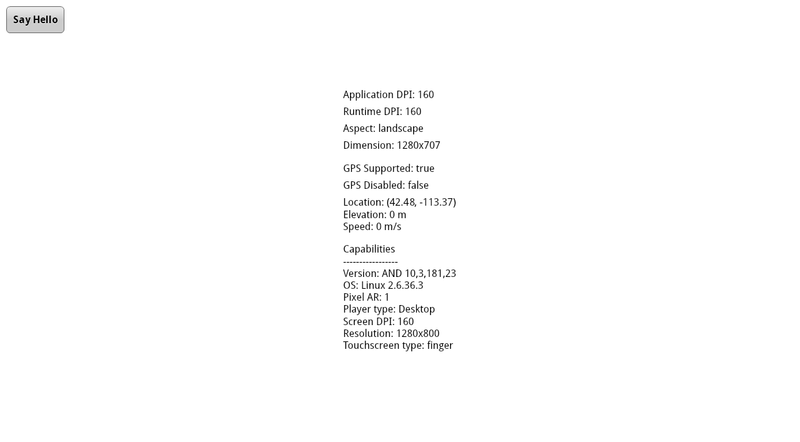 I've put together a simple app that shows some of the properties available to mobile applications. Click the screenshot below to see the full size. You can download the project file here. In Flash Builder choose "File - Import...", and then choose "Flash Builder - Flash Builder Project", and select the downloaded fxp file.